Premature circuit clotting is a major problem in daily practice of continuous renal replacement therapy (CRRT), increasing blood loss, workload, and costs. Early clotting is related to bioincompatibility, critical illness, vascular access, CRRT circuit, and modality. This review discusses non-anticoagulant and anticoagulant measures to prevent circuit failure. These measures include optimization of the catheter (inner diameter, pattern of flow, and position), the settings of CRRT (partial predilution and individualized control of filtration fraction), and the training of nurses. In addition, anticoagulation is generally required. Systemic anticoagulation interferes with plasmatic coagulation, platelet activation, or both and should be kept at a low dose to mitigate bleeding complications. Regional anticoagulation with citrate emerges as the most promising method. During continuous renal replacement therapy (CRRT), blood is conducted through an extracorporeal circuit, activating coagulation by a complex interplay of patient and circuit. Critically ill patients may develop a procoagulant state due to early sepsis, hyperviscosity syndromes, or antiphospholipid antibodies. In early sepsis, activation of the coagulation system is triggered by proinflammatory cytokines that enhance the expression of tissue factor on activated mononuclear and endothelial cells and simultaneously downregulate natural anticoagulants, thus initiating thrombin generation, subsequent activation of platelets, and inhibition of fibrinolysis . Initiation of clotting in the extracorporeal circuit traditionally has been attributed to contact activation of the intrinsic coagulation system (Figure 1). However, the bioincompatibility reaction is more complex and is incompletely understood. Activation of tissue factor, leucocytes, and platelets play an additional role . However, thrombin activation has been observed even without detectable systemic activation of these systems [3, 4]. Some of these processes may occur locally at the membrane. Other reasons for premature clotting related to the CRRT technique are repeated stasis of blood flow , hemoconcentration, turbulent blood flow, and blood-air contact in air-detection chambers . Circuit clotting has further been observed in association with a high platelet count and platelet transfusion [7, 8]. Premature clotting reduces circuit life and efficacy of treatment and increases blood loss, workload, and costs of treatment. Therefore, improving circuit life is clinically relevant. Mechanism of contact activation by hemofilter membranes. ADP, adenosine diphosphate; C, complement factor; GP, glycoprotein; HMWK, high molecular weight kininogens; PAF, platelet activating factor released by polymorphonuclear cells; plt., platelets; RBC, red blood cells; TF, tissue factor expressed by adhering monocytes; TXA, thromboxane A2. The interpretation of studies evaluating circuit life in CRRT, however, is hampered by the complexity and interplay of the factors mentioned. Furthermore, circuits are disconnected because of imminent clotting, protein adsorption to the membrane causing high transmembrane pressures (clogging), or logistic reasons such as transport or surgery. In addition, some units change filters routinely after 24 to 72 hours. Despite a lack of proof supported by large randomized trials, several measures seem sensible for prolonging patency of the CRRT circuit. One major intervention to influence circuit life is anticoagulation. Given a recent review on anticoagulation strategies in CRRT , this overview also incorporates the role of non-anticoagulant measures for circuit survival. Vascular access is a major determinant of circuit survival. Both high arterial and venous pressures are detrimental. Access failure causes blood flow reductions, which are associated with early circuit clotting . In vitro studies have found that high venous pressures in the circuit reduce circuit life . Randomized studies in critically ill patients on CRRT which evaluate the effect of catheter site or design on circuit flow and survival are not available. Most information comes from observational and in vitro studies in chronic hemodialysis patients, who need their catheters intermittently and for a much longer time (reviewed in ). Some general principles are summarized in Figure 2 and are discussed below. Features of vascular access contributing to extracorporeal blood flow. ICV, inferior caval vein; P, pressure; Q, blood flow; RA, right atrium. According to Poisseuille's law, flow through a catheter is related to the fourth power of radius and inversely related to length, indicating that a thick (13 to 14 French) and short catheter is preferable. However, a more central position of the tip improves flow, dictating sufficient length. In chronic dialysis patients, best flows are obtained with the tip in the right atrium [12, 13]. With the femoral route, tip position should be positioned in the inferior caval vein. Because the inner diameter counts, the material is crucial. In general, silicone catheters have thicker walls than polyurethane catheters. Another issue is the presence of side or end holes. Flow through end holes is laminar, which is optimal, whereas flow through side holes is turbulent and even locally stagnant, contributing to early clotting. Suctioning of side holes against the vessel wall may impair flow, which is minimized with side holes over the (near) total circumference and absent with end holes. Another important determinant of catheter flow is the patient's circulation. For example, catheter dysfunction was found to be associated with low central venous pressure . Furthermore, kinking of the catheter may impair catheter flow. Subclavian access has an enhanced risk of kinking and of stenosis with longer catheter stay [14–16]. The right jugular route is the straightest route. 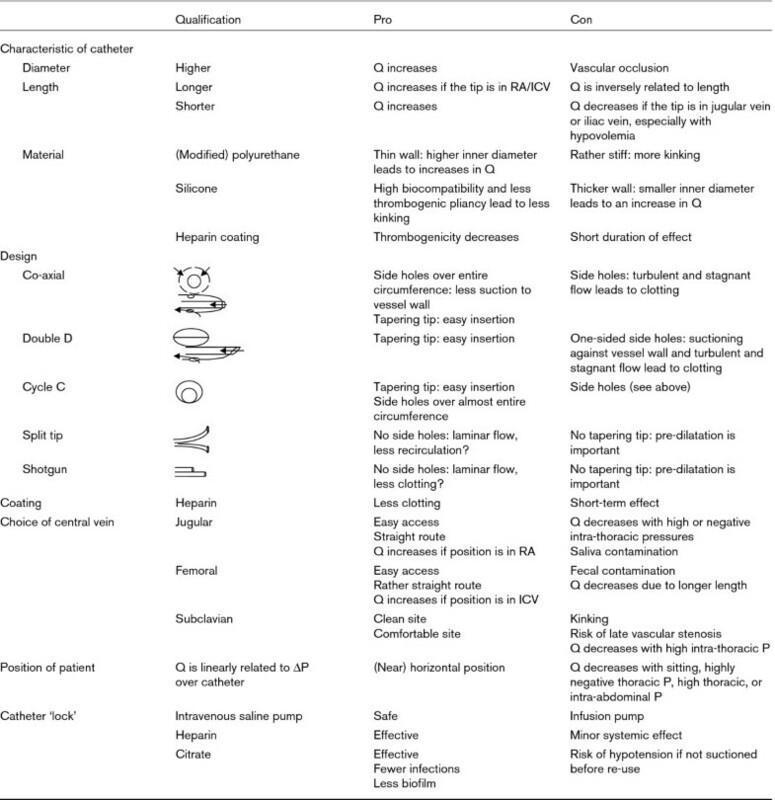 Furthermore, high abdominal pressures or high or very negative thoracic pressures, occupancy by other catheters, patency or accessibility of veins, anatomy, posture, and mobility of the patient determine choice of the site. Ultrasound-guided catheter placement significantly reduces complications . An important issue is locking of the CRRT catheter when not in use by controlled saline infusion or by blocking with heparin or citrate solutions to prevent fibrin adhesion, which slowly reduces lumen diameter [18, 19]. Slow reaction to pump alarms contributes to stasis of flow and early filter clotting. Training includes the recognition and early correction of a kinked catheter and the adequate rinsing of the filter before use since blood-air contact activates coagulation [20, 21]. Intermittent saline flushes have no proven efficacy . Filling of the air detection chamber to at least two thirds minimizes blood-air contact. For several reasons, continuous venovenous hemofiltration (CVVH) appears to be associated with shorter circuit life than continuous venovenous hemodialysis (CVVHD) . First, for the same CRRT dose, hemofiltration requires higher blood flows. Higher blood flows give more flow limitation and more frequent stasis of blood flow. Second, hemofiltration is associated with hemoconcentration, occurring as a consequence of ultrafiltration. Within the filter, hematocrit (Ht), platelet count, and coagulation factors increase the likelihood of coagulation. Continuous venovenous hemodiafiltration (CVVHDF) combines the possible advantages of hemofiltration (higher middle molecular clearance) with less hemo-concentration. Higher solute clearances can be attained at relatively lower blood flows and may thus increase circuit survival. However, a prospective survey in children on 442 CRRT circuits (heparin and citrate) could not find a correlation between circuit survival and CRRT mode (CVVH, CVVHD, or CVVHDF) . To minimize the procoagulant effects of hemoconcentration, it is recommended to keep the filtration fraction (the ratio of ultrafiltrate flow [QF] to blood flow [QB]) as low as possible; a value below 25% is generally recommended in postdilution mode. It may be more rational to adjust the filtration fraction to the patient's Ht because blood viscosity in the filter is the limiting factor. Although many factors contribute to blood viscosity, Ht is the main determinant and is available at bedside. A Ht in the filter (Htfilter) of 0.40 may be acceptable. Htfilter and the minimal QB required for the prescribed QF can be calculated at bedside. QB = QF × (Htfilter/(Htfilter - Htpatient). Another option for reducing the filtration fraction is to administer (part of) the replacement fluid before the filter. In predilution CRRT, substitution fluids are administered before the filter, thus diluting the blood in the filter, decreasing hemoconcentration, and improving rheological conditions. One small randomized cross-over study (n = 15) and one study comparing 33 patients on predilution CVVH to 15 historical postdilution controls found longer circuit survival with predilution [25, 26] at the cost of a diminished clearance . However, compared to the historical controls, mean daily serum creatinine changes were not significantly different . Reduced filter downtime may compensate for the lower predilution clearance. Predilution particularly reduces middle molecular clearance , the clinical consequences of which are still unclear. Clogging is due to the deposition of proteins and red cells on the membrane and leads to decreased membrane permeability. Clogging is detected by declining sieving coefficients of larger molecules and increasing transmembrane pressures. Clogging enhances the blockage of hollow fibers as well. The process is still incompletely understood, but interplay between the protein constitution of plasma, rheological characteristics of blood, capillary and transmembrane flow, membrane characteristics, and possibly the use of different resuscitation fluids influence this process [10, 27]. It has been suggested that with predilution, membrane performance is better maintained by reducing protein adsorption. On the other hand, others have shown more protein adsorption with predilution . This may be explained by the higher ultrafiltration rate, opening more channels and thus increasing the actual surface and the amount of protein adsorbed. Future developments to reduce protein adsorption include hydrophilic modification of polyetersulfone . Biocompatibility is significantly influenced by membrane characteristics. Main determinants are electronegativity of membrane surface and its ability to bind plasma proteins, as well as complement activation, adhesion of platelets, and sludging of erythrocytes  (Figure 1). Few studies have evaluated the influence of membrane material on filter run times. Membranes with high absorptive capacity generally have a higher tendency to clot. In a non-randomized controlled study, polyamide exhibited later clotting than acrylonitrile (AN69) . Modification of existing membranes to increase heparin binding (AN69ST) reduced clotting in intermittent hemodialysis . Newer membranes with various polyethersulfone coatings that reduce activation of coagulation are being developed . Up to now, large randomized controlled trials evaluating the influence of the type of membrane on circuit life during CRRT have been missing. Filter size may play a role and larger surfaces may be of relevance for filter survival and solute clearance when CVVHD is applied. A comparison of two polysulphone hemofilters with different hollow fiber lengths showed transmembrane pressure and increased survival time being lower with the longer filter . Anticoagulation of the extracorporeal circuit is generally required. However, systemic anticoagulation may cause bleeding . The risk of bleeding in critically ill patients is high because of frequent disruption of the vascular wall and coagulopathy. Therefore, clinicians search for alternatives such as CRRT without anticoagulation [35–38], increasing natural anticoagulants, minimal systemic anticoagulation, or regional anticoagulation. Heparin acts by a 1,000-fold potentiation of antithrombin (AT) to inhibit factors Xa and IIa (thrombin). Low levels of AT decrease heparin activity and are associated with premature clotting of the circuit [3, 39, 40]. In a non-randomized study in patients on CRRT, AT deficiency (less than 60%) was associated with early filter clotting, whereas supplementation increased circuit life . In a recent retrospective case control study in patients with septic shock undergoing CRRT with heparin, supplementation of AT to keep plasma concentration above 70% increased circuit survival time . Recombinant human activated protein C (rhAPC), used in severe sepsis, inhibits the formation of thrombin by degrading coagulation factors Va and VIIIa. Furthermore, it might decrease the synthesis and expression of tissue factor and enhance fibrinolysis . During administration of rhAPC, additional anticoagulation for CRRT is probably not required . Systemic anticoagulation inhibits plasmatic coagulation, platelet function, or both. Low-dose anticoagulation is usually sufficient to keep the filter patent and mitigates the increased risk of bleeding associated with full anticoagulation. Effects in the circuit are highest with local administration. Unfractioned heparin (UFH) is the predominant anticoagulant. Its major advantages are the low costs, ease of administration, simple monitoring, and reversibility with protamine [9, 45]. The half-life of UFH is approximately 90 minutes, increasing to up to 3 hours in renal insufficiency due to accumulation of the smaller fragments. Monitoring with activated partial thromboplastin time (aPTT) is still the best option. Retrospective analyses indicate increased bleeding if systemic aPTT is longer than 45 seconds . At this low level of anticoagulation, activated clotting time is relatively insensitive for monitoring . However, aPTT appears to be an unreliable predictor of bleeding [9, 47]. Given these limitations, a possible scheme for UFH consists of a bolus of 30 IU/kg followed by an initial rate of 5 to 10 IU/kg per hour in patients with normal coagulation. However, the level of anticoagulation should be individualized. Apart from bleeding, major side effects of UFH include development of heparin-induced thrombocytopenia (HIT), hypoaldosteronism, effects on serum lipids, and AT dependency . Low molecular weight heparins (LMWHs) exhibit several advantages, including lower incidence of HIT , lower AT affinity, less platelet and polymorphonuclear cell activation, less inactivation by platelet factor-4 (PF-4), higher and more constant bioavailability, and lack of metabolic side effects [47, 49, 50]. However, data on the use of LMWH in CRRT are limited [7, 51–53]. Dalteparin, nadroparin, and enoxaparin have been investigated. Their mean molecular weight is between 4.5 and 6 kDa, and their mean half-life ranges from 2.5 to 6 hours and is probably even longer in renal insufficiency. However, there are indications that LMWHs are eliminated by CRRT . Although some studies use LMWH in a fixed dose [7, 52], continuous intravenous application of LMWH, aiming at systemic anti-FX levels of 0.25 to 0.35 U/ml, may be the safest option . However, anti-Xa may not be a reliable predictor of bleeding  and anti-Xa determinations are not generally available. HIT is caused by a heparin-induced antibody that binds to the heparin-PF-4 complex on the platelet surface. This may or may not lead to platelet activation and consumption, thrombocytopenia, and both arterial and venous thrombosis. Depending on the dose and type of heparin, the population, and the criteria used, 1% to 5% of treated patients develop HIT . Platelet count typically rapidly decreases by more than 50% after approximately 1 week or earlier after previous use of heparin. Diagnosis depends on a combination of clinical and laboratory results . A reliable diagnosis is complicated by the fact that the incidence of a false-positive enzyme-linked immunosorbent assay test is high . Unfortunately, the more precise carbon 14-serotonin release assay is not routinely available. Awaiting final diagnosis, all kinds of heparins should be discontinued and an alternative anticoagulant started. There are no randomized controlled trials showing which anticoagulant is best for HIT. The choice depends on local availability and monitoring experience. If citrate is used for anticoagulation of the circuit, separate thromboprophylaxis must be applied. 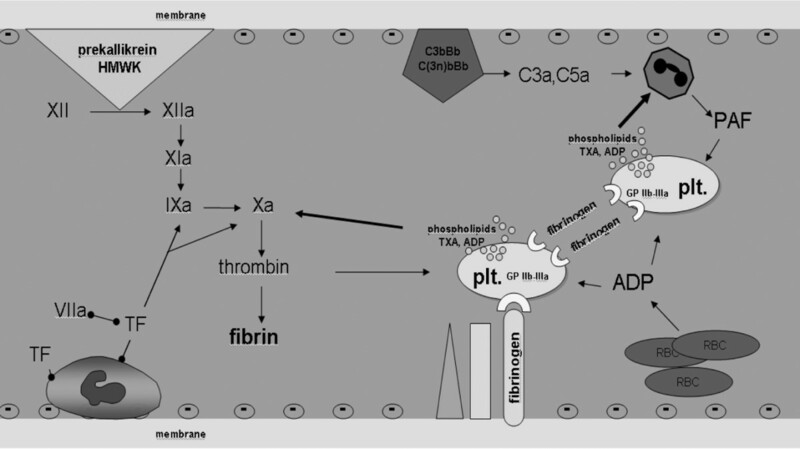 Inhibition of thrombin generation can be obtained via direct inhibition of FIIa (r-hirudin, argatroban, or dermatan sulphate), FXa (danaparoid or fondaparinux), or both (nafamostat). Inhibition of platelet activation can be obtained by the use of prostaglandins (PGs) (summarized in [9, 59]). The use of r-hirudin is discouraged because of severe adverse events, extremely long half-life (170 to 360 hours), and the requirement of ecarin clotting time for monitoring . Given the long half-life of fondaparinux and danaparoid (more than 24 hours), monitoring of anti-Xa is mandatory. The clinical relevance of cross-reactivity of danaparoid with HIT antibodies is not known . Argatroban might be preferred because it is cleared by the liver and monitoring with aPTT seems feasible [62–65]. The half-life is approximately 35 minutes in chronic dialysis, but longer in the critically ill. Up to now, clinical data in CRRT and availability of the drug have been limited. Inhibition of platelet activation by PGs appears to be justified because the extracorporeal generation of thrombin and the use of heparin cause platelet activation. Both PGE1 and PGI2 have been investigated in CRRT, alone or in combination with heparins. The exclusive use of PGs in CVVH (1.5 liters per hour in predilution) provided a rather short circuit survival (median, 15 hours) . Nevertheless, PGs may be a safe initial alternative when HIT is suspected. They can even be used in patients with hepatic and renal failure . Significant improvement of circuit survival, however, could be achieved only when PGs were combined with low-dose UFH or LMWH [68–70]. PGs are administered in doses of 2 to 5 ng/kg per minute. Major drawbacks for routine use are their high costs and hypotension due to vasodilatation, but the half-life of the vasodilatory effect is as short as 2 minutes. Regional anticoagulation can be achieved by the prefilter infusion of citrate. Citrate chelates calcium, decreasing ionized calcium (iCa) in the extracorporeal circuit. For optimal anticoagulation, citrate flow is adjusted to blood flow, targeting at a concentration of 3 to 5 mmol/l in the filter . Postfilter iCa can be used for fine tuning of the level of anticoagulation, aiming at a concentration of iCa of less than 0.35 mmol/l (Table 1). However, others prefer a fixed citrate dose and do not monitor iCa in the circuit, thereby simplifying the procedure (summarized in ). Citrate is partially removed by convection or diffusion and partially enters the systemic circulation, where iCa rises again due to the dilution of extracorporeal blood, the liberation of chelated calcium when citrate is metabolized, and the replacement of calcium. As a result, systemic effects on coagulation do not occur. Citric acid enters the mitochondria and is metabolized in the Krebs cycle, mainly in the liver but also in skeletal muscle and the renal cortex, leaving sodium bicarbonate. Citrate removal by CRRT mainly depends on CRRT dose and not on modality. Citrate clearance approximates urea clearance. The sieving coefficient is between 0.87 and 1.0 and is not different between CVVH and CVVHD [72, 73]. Citrate removal with CRRT also depends on citrate concentration in the filter and filtration fraction; high fractions are associated with relatively higher citrate clearance and a lower buffer supply to the patient. The use of regional anticoagulation with citrate is limited by the patient's capacity to metabolize citrate, which is decreased if liver function or tissue perfusion fails . Due to the citrate load associated with transfusion, patients having received a massive transfusion are also at risk of citrate accumulation. If citrate accumulates, iCa decreases and metabolic acidosis ensues, since bicarbonate continues to be removed by filtration or dialysis, while citrate is not used as a buffer. In daily clinical practice, citrate measurement is hampered by the limited stability of the reagents. However, accumulation of citrate due to decreased metabolism can be detected accurately by the symptoms of metabolic acidosis, increasing anion gap, ionized hypocalcemia, and most specifically by an increased total/iCa concentration. A ratio of more than 2.1 predicted a citrate concentration of greater than 1 mmol/l with 89% sensitivity and 100% specificity . Others use a ratio of more than 2.5 for accumulation . Accumulation of citrate can also be the result of an unintended citrate over-infusion or of decreased removal in case of a decline in membrane performance at constant citrate infusion. In these cases, ionized hypocalcemia occurs together with metabolic alkalosis. Both derangements are preventable by adherence to the protocol or are detectable early by strict monitoring. Anticoagulation with citrate has complex metabolic consequences, which are related to the dual effects of citrate as an anticoagulant and a buffer. Manipulation of citrate or blood flow, ultrafiltrate, dialysate, or replacement rates, and their mutual relation changes the amount of buffer substrate entering the patient's circulation. For a constant buffer delivery, these flows are to be kept constant, while they can be adjusted to correct metabolic acidosis or alkalosis. Causes of metabolic derangements and possible adjustments are summarized in Table 2.
or stop additional bicarbonate i.v. iCa, ionized calcium; i.v., intravenous; totCa/iCa, ratio of total to ionized calcium. Citrate is either infused as a separate trisodium citrate solution or added to a calcium-free predilution replacement fluid. The strength of citrate solutions is generally expressed as a percentage (grams of trisodium citrate per 100 ml). Some of the solutions contain additional citric acid to reduce sodium load. Because anticoagulatory strength of the solution depends on the citrate concentration, it is best expressed as molar strength of citrate. Citrate solutions for postdilution CVVH(D) contain 133 to 1,000 mmol citrate per liter [73, 75–82]. Citrate replacement solutions for predilution CVVH contain 11 to 15 mmol citrate per liter [83–88] and for predilution CVVHDF, 13 to 23 mmol/l [40, 89–92]. The buffer strength of the solution is related to the conversion of trisodium citrate to citric acid (see formula above) and therefore to the proportion of sodium as cation. After the first report of Mehta and colleagues , a wide variety of homemade citrate systems for CRRT have been described. There are systems for CVVHD, predilutional or postdilutional CVVH, CVVHDF, and different doses of CRRT (1.5 to 4 liters per hour) (summarized in the electronic supplemental material in ). None of the proposed systems can attain perfect acid-base control using one standard citrate, replacement, or dialysis solution. Each protocol has its own rules to correct metabolic acidosis or alkalosis or hypocalcemia or hypercalcemia. Some of the published studies compare circuit life and bleeding complications with citrate to historical or contemporary non-randomized controls on heparin (summarized in ) [93–95]. Because the citrate patients often had a higher risk of bleeding, groups are generally not comparable. Nevertheless, bleeding complications were generally reduced in the citrate groups. Circuit survival with citrate was usually improved (summarized in ) , sometimes comparable [24, 84, 95], and in some studies shorter than with heparin [89, 94]. Differences in circuit life between studies can be explained in part by the wide variety of citrate dose (2 to 6 mmol/l blood flow), fixed citrate infusion or citrate dose titrated on postfilter iCa, the use of dialysis or filtration (predilution or postdilution), differences in CRRT dose and filtration fraction, or by a reduction in citrate flow used for control of metabolic alkalosis. Only two small randomized controlled studies comparing anticoagulation with citrate to UFH have appeared in a full paper. Both show a significantly longer circuit survival with citrate [40, 82], a trend toward less bleeding , and less transfusion with citrate . It may be questioned whether the benefits of citrate (less bleeding, possibly a longer circuit survival, and less bio-incompatibility [96–98]) weigh against the greater risk of metabolic derangement and possible long-term side effects like increased bone resorption . Preliminary results from a large randomized controlled trial (of approximately 200 patients) comparing regional anticoagulation with citrate to nadroparin in postdilution CVVH show that citrate is safe and superior in terms of mortality to nadroparin (H.M. Oudemans-van Straaten, to be published). Premature clotting of the CRRT circuit increases blood loss, workload, and costs. Circuit patency can be increased. Non-anticoagulation measures include optimization of vascular access (inner diameter, pattern of flow, and position), CRRT settings (partial predilution and individualized control of filtration fraction), and the training of nurses. Systemic anticoagulation interferes with plasmatic coagulation, platelet activation, or both and should be kept at a low dose to mitigate bleeding complications. Regional anticoagulation with citrate emerges as the most promising method. This article is part of a review series on Renal replacement therapy, edited by John Kellum and Lui Forni.